But instead of using traditional weaving materials such as wool, silk or linen, I weave only with discarded materials, mainly plastic packaging. I use the metallised plastic film increasingly used for snack packs, coffee bags etc; un-reusable plastic mail-order wrappers and bags; supermarket fruit and veg nets and commercial plastic waste – scaffolding net, wrapping materials. I aim to convey my feelings about the wastefulness and non-recyclability of much plastic and packaging with graffiti-inspired and other images. Last year, David Attenborough and Blue Planet II did much to raise awareness of plastic waste and sparked a flurry of activity: bans on plastic straws, charges for single use coffee cups and so on. But on packaging we have barely begun. The long-overdue introduction of plastic bag charges in England still does not apply to many outlets, and plastic packaging is more widespread than ever and often unnecessary, wasteful, un-reusable and unrecyclable. This is particularly so with mail order wrappers, which are usually impossible to re-use and despite having recycling symbols on them are not accepted in household recycling in Ealing. The metallised film in snack and coffee bags is hardly ever recyclable. 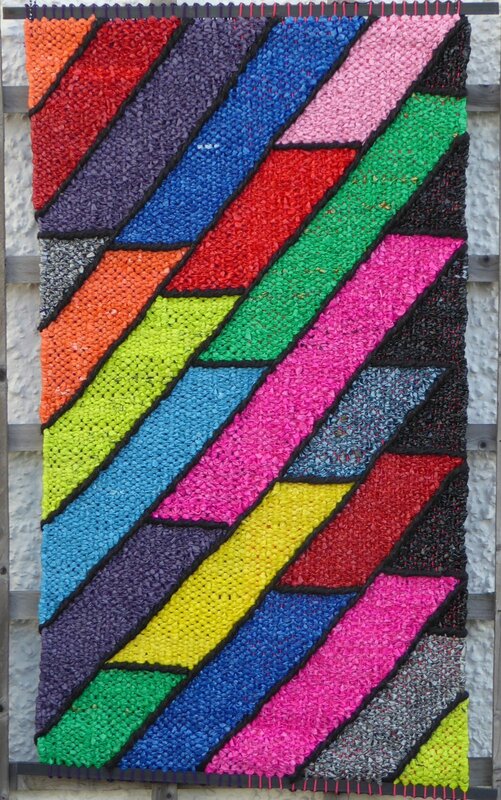 During BEAT I will be showing tapestries woven with all the main types of plastic packaging I use. I will also have information about tapestry weaving, what defines it and why the Bayeux Tapestry, tapestry kits and Grayson Perry’s woven images are NOT tapestries.